This article was last updated Oct 26, 2018, but some terms and conditions may have changed or are no longer available. For the most accurate and up to date information please consult the terms and conditions found on the issuer website. As a graduate student, you most likely will have more expenses and responsibilities compared to when you were an undergrad. You may be working full time, paying rent, managing the cost of furthering your education and dealing with other costs. Using the right credit card can help you cover expenses when cash flow is tight and allow you to take advantage of perks and rewards. Hopefully you already have experience with credit and have used a credit card as an undergrad, allowing you to qualify for better cards than grad students with no prior credit experience. But don’t worry if you lack credit or have no credit — there are cards designed with you in mind. In this guide, we’ll review the best credit cards for graduate students, regardless of whether you have a good credit history or none at all. Before you open a credit card, it’s a good practice to check your credit score so you can tailor your search to cards for which you may qualify. LendingTree, our parent company, provides a free credit score via My LendingTree where you can not only check your credit score but discover factors that influence your score and learn how you can improve it. A student card can be a good place to start if you lack credit history and are planning on opening your first credit card as an undergrad. Most cards require you to apply using an .edu email to verify your status as a student. The cards mentioned in this section all have no annual fees and offer rewards programs, among other perks. Note: If you already have a student card or other credit card, you can check out the following sections that list non-student cards. (36) Over the Past 60 Days! 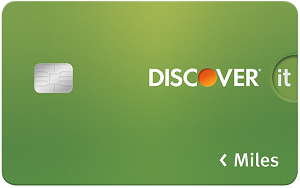 The Discover it® Student Cash Back is our top pick for a student card because of the high value it provides students. The cashback program allows you to earn 5% cash back at different places each quarter like gas stations, grocery stores, restaurants, Amazon.com and more up to the quarterly maximum each time you activate, 1% unlimited cash back on all other purchases - automatically. Just remember to activate the bonus categories. In addition, Discover will automatically match all the cash back you earn at the end of your first year. A helpful perk is the intro 0% for 6 months on purchases (after, 15.24% - 24.24% Variable APR), which can be helpful if you need to make purchases for textbooks or furniture that you can’t pay for right away. 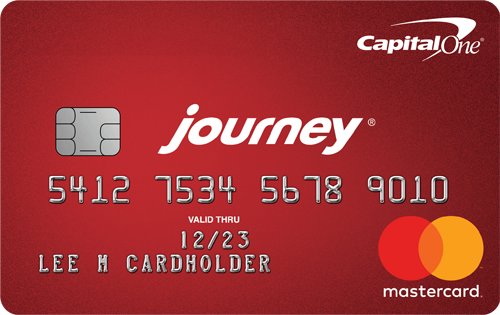 The Journey® Student Rewards from Capital One® is a flat-rate cashback card for students. You earn 1% cash back on all purchases; 0.25% cash back bonus on the cash back you earn each month you pay on time. This is a subpar rate considering non-student cards offer higher flat rates of 1.5% and 2%, but if you have average/fair/limited credit, this is better than nothing. An additional perk of this card is the ability to receive a higher credit limit after making your first five monthly payments on time. Check out our guide on the best student credit cards. If you have poor credit or no credit at all, don’t lose hope in finding a decent credit card — you have options. But before you consider opening a credit card, you should evaluate why you want a credit card and decide if you’re in the best financial position. If you have poor credit, you most likely haven’t been using your credit card responsibly and may have overspent, racked up debt or missed several payments — some of which may be due to inconsistent income. You should avoid using a credit card as a temporary fix to cash flow issues since it can lead you to more debt. When you decide to open a credit card with poor credit or no credit, we recommend sticking to secured cards. They often allow applicants with less-than-stellar credit to apply and have fewer fees than credit cards marketed toward consumers with bad credit. A secured card is like a traditional unsecured card, but you’re required to make a cash deposit that becomes your line of credit. (39) Over the Past 60 Days! 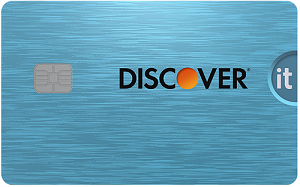 The Discover it® Secured is our favorite secured card since it offers a cashback program and a simple transition to an unsecured card. Cardholders earn 2% cash back at gas stations and restaurants on up to $1,000 in combined purchases every quarter, automatically. 1% unlimited cash back on all other purchases. A great additional perk is the monthly account reviews that Discover conducts starting at eight months where it’ll review your account to see if you can be refunded your security deposit — all while benefiting from the full features of your card. This takes the guesswork out of wondering when you’re ready for an unsecured card. 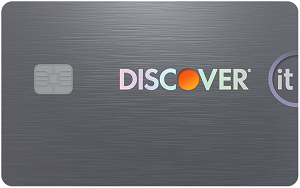 The Capital One® Secured Mastercard® doesn’t offer rewards like the Discover it® Secured, but it does provide the opportunity for a lower security deposit, which is helpful if you may not be able to afford a $200 deposit. The minimum deposit requirements are $49, $99 or $200, depending on your creditworthiness. If you qualify for the $49 or $99 rate, you still receive a $200 credit limit. Also, if you make your first five monthly payments on time, you may receive an increased line of credit without needing to make an additional deposit. Read our guide on the best credit cards for bad credit. If you have fair credit, you may be able to qualify for several credit cards offering rewards or no annual fees. The cards listed below are unsecured, which means they don’t require you to make a deposit to access credit like the secured card recommendations listed above under bad credit. 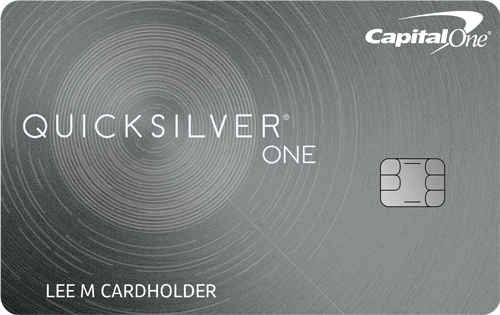 The Capital One® QuicksilverOne® Cash Rewards Credit Card offers a cashback program where you earn 1.5% cash back on every purchase, every day. This is good considering the card requires average/fair/limited credit. There is a $39 annual fee, but if you spend $2,600 a year you can earn enough cash back to recoup the fee. Additional benefits of this card include auto rental and travel accident insurance, 24/7 travel and roadside assistance, no foreign transaction fees, price protection and more. 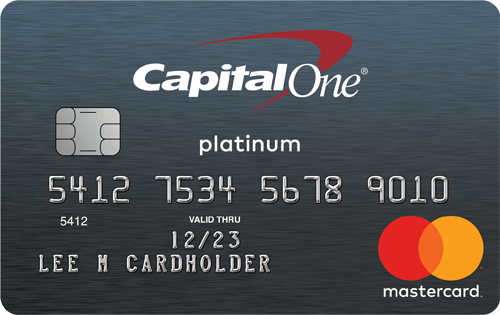 The Capital One® Platinum Credit Card is a no-frills card that is ideal if you travel abroad often. This card has no foreign transaction fee, which saves you the typical 3% fee many other cards charge per purchase abroad. Like the other Capital One cards mentioned earlier, if you make your first five monthly payments on time, you’ll receive a higher credit limit. This card also offers auto rental and travel accident insurance, 24/7 travel and roadside assistance, price protection and other Platinum Mastercard benefits. Read our guide of the best credit cards for fair credit. If you enter grad school with good credit, you’ll be able to qualify for significantly better cards than students with bad or fair credit. Some of the best credit cards available are reserved for people with good or excellent credit, and we list a few of our top picks below. The Citi® Double Cash Card – 18 month BT offer is one of the best flat-rate cashback cards available with the ability to earn 2% cash back on purchases: 1% when you buy plus 1% as you pay. Unlike other cards that have rotating bonus categories that require activation, you earn the same rate on every purchase. Additional perks include the potentially money-saving Citi® Price Rewind, where Citi will conduct a 60-day search for a lower price on eligible purchases you register. If a lower price is found, you may receive the difference between the price you paid and the lower price. (486) Over the Past 60 Days! The Discover it® Miles is a good $0 annual fee travel card that earns you an unlimited 1.5x miles per dollar on all purchases, every day. This is a good rewards rate considering many travel cards offering higher rewards rates come with annual fees that can be as high as $550. Another helpful perk for travelers is the lack of foreign transaction fees. This saves you the typical 3% fee some other cards charge for purchases made outside the U.S. For new cardmembers, Discover will automatically match all the Miles you've earned at the end of your first year. Compare credit cards for good credit. When you have excellent credit, you may qualify for the best credit cards that offer a wide range of perks that can include travel credits, select insurances, robust rewards programs and more. Below, we list some of our favorite credit cards for excellent credit. (767) Over the Past 60 Days! If you have debt on an existing credit card, a balance transfer can be a good way to get out of debt. The Citi Simplicity® Card - No Late Fees Ever offers an intro 0%* for 21 months on balance transfers* (after, 16.24% - 26.24%* (Variable) APR), which can help you get out of debt — granted you pay off your balance before the end of the intro period. This card also offers an intro 0%* for 12 months on Purchases* (after, 16.24% - 26.24%* (Variable) APR) that can help you finance new purchases. The Amex EveryDay® Credit Card from American Express is an all-around solid card for rewards, balance transfers and financing new purchases. Cardholders earn 2x points at US supermarkets, on up to $6,000 per year in purchases (then 1x), 1x points on other purchases. There’s also a welcome offer of 10,000 Membership Rewards® points after you use your new Card to make $1,000 in purchases in your first 3 months. This card has two great intro periods for you to take advantage of with an intro 0% for 15 months on purchases and intro 0% for 15 months on balance transfers (15.24% - 26.24% Variable, once the introductory periods end). And, unlike other cards with a 3% to 5% balance transfer fee, there’s a $0 balance transfer fee. The information related to The Amex EveryDay® Credit Card from American Express has been collected by CompareCards and has not been reviewed or provided by the issuer of this card before publication. Compare credit cards for excellent credit and read our guide on the best credit cards of 2018.